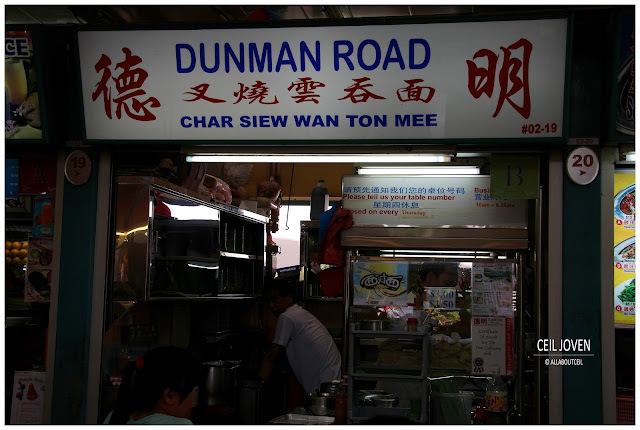 ALL ABOUT CEIL: Dunman Road Wanton Mee. I decided to check out this supposedly famous wanton mee stall after had a good one at other famous wanton noodle at the basement. This stall is located at the upper level of the food centre. I was their only customer at 2.30 pm. At about the same timing, the other one at the basement has got many customers still waiting to place their orders or waiting to collect their orders. I placed my order with the cheerful female assistant. I wanted the smaller plate of wanton mee at $3 for tasting purpose. I expected it to be self-service but she asked for my table number. I pointed at the other side of the food centre. She smiled and asked me to take a seat. I took notice of some media reports pasted right in front of their stall. This stall was featured in a TV programme once. The wait was a short while. I spotted the friendly assistant approached my table with my place of wanton mee in 5 minutes. The presentation of the mee was quite a boring one. 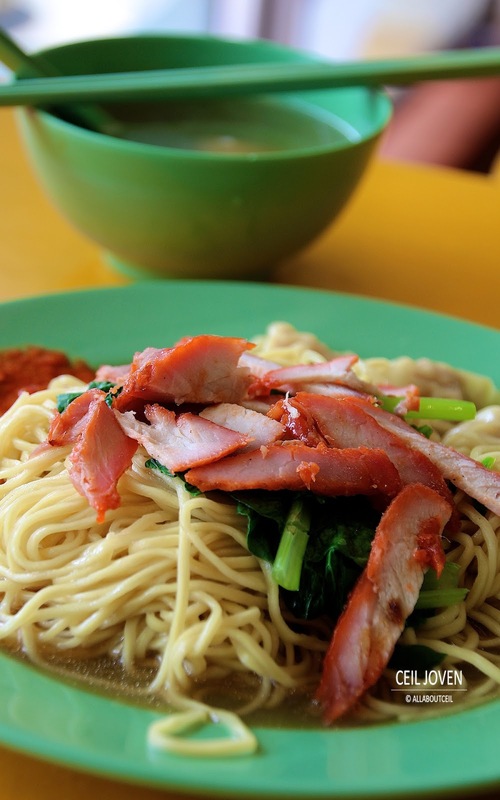 The mee looked rather plain with a few pieces of equally plain looking char siew and a bit of vegetable. If you are a fan of the famous Kok Kee Wanton Noodle at Lavender Food Square then you might spot the similarity. 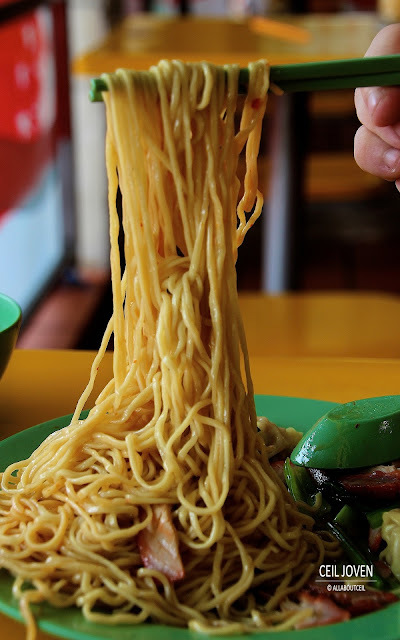 The pile of mee was served in a pool of clear looking sauce. I did not think too highly of this plate of wanton mee at that moment. I tossed it well with a small amount of chilli sauce at the side of the plate. As i underestimated the level of spiciness of this innocent looking chilli sauce, i was very much caught by surprise and nearly choked by the unexpected spiciness. I would think i have a pretty high tolerance level of spiciness so i did not quite expect to give in to the intensity of the spiciness. I understand the famous Eng's Wanton Noodle has such kind of chilli sauce for self-service on their tables. I guess i should go by there to check it out soon. 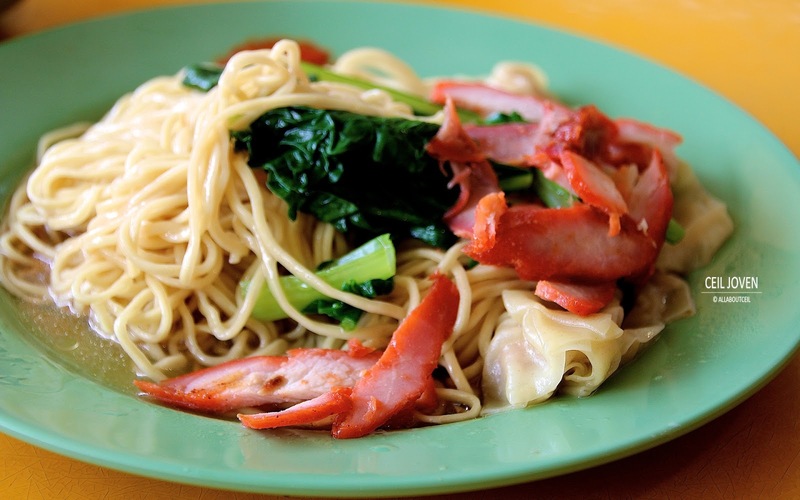 The texture of mee has got a delightful eggy taste with a distinctive springiness to give it a desired chewiness. I did not think too much of the slices of char siew though. It tasted pretty average. My guess is the stall did not make it themselves and that very much explained on the disappointing standard. The 3 pieces of wantons were served with the noodle and not in the soup. The lightly seasoned minced meat filling was wrapped in thin pieces of wanton skin. It has got a comforting old school taste which i liked the most. The soup tasted rather light with a peppery taste. This is another good standard wanton mee but it does not seem to have too many supporters as compared to the other one at the basement.